The beginning of October is one of my favourite times of the year as it marks Horse of the Year Show (HOYS) week. 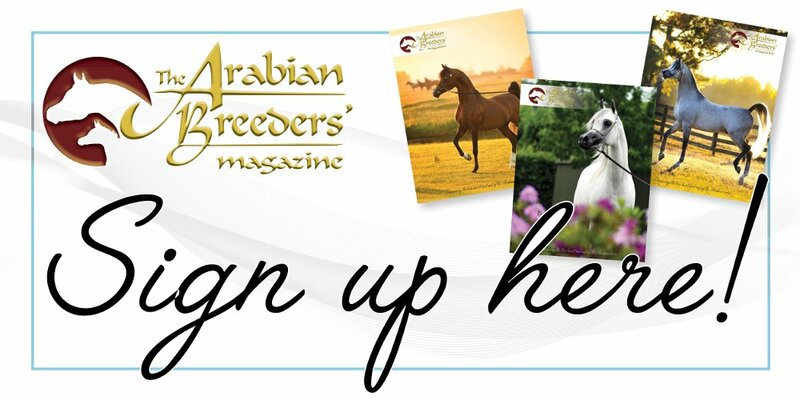 Although I was not competing – one year Katherine, one year – I had the most incredible time watching the Arabs on the Wednesday and reporting the results to The Arabian Magazine, the Working Hunter Ponies on the Friday, and the Supremes on the Sunday. Many people could consider me a complete moron for missing University lectures so early on in the semester, but I have a long history of forcing my education around the horses and somehow juggling both – much to my previous schools’ amusement. University is actually a lot easier to skive off than high school. I don’t need any excuses and, as long as I don’t miss a seminar or a workshop, only my friends would ever know. Of course, I don’t recommend skipping lectures and I am usually a stalwart in the lecture theatre, but HOYS brings out a much deeper need that can only be satisfied through the sights, sounds, and even smells of the world’s most famous horse show. 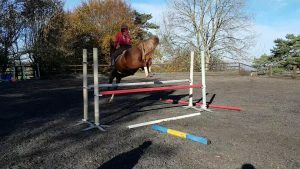 After a long summer of Odin – Avonbrook Odin (Marcus Aurelius x April) – sitting on the bench, mum finally deemed him fit enough to resume lessons with Erica, which certainly don’t let horse nor rider slack off! After one session that worked on getting the idle boy to bend the correct way and actually use his immensely powerful back-end, Odin was back and, in Erica’s words, “better than ever”! Odin is now working incredibly in lessons and his jump is beginning to regain the power and scope that I remember from our first 1.15 and his pre-injury days. It now seems like a lifetime ago that Odin was found in shock one morning after presumably getting cast, kicking a front board of the stable out, and trapping his neck. In the end, I’m glad we treated it as a serious injury despite no evidence of fractures because, if we had rushed him either physically or mentally, I’m certain we would never have got him back where he was before. To show us how fixed he is, Odin has been storming around a few 1m classes while I get my confidence back up to go higher again. It’s incredible how fragile confidence is and, while five months ago I would have scoffed at jumping Odin over Discovery tracks (100-110cm), it’s quite high enough for me at the moment. It’ll come back to me with patience, but so long away from jumping Newcomers (110-120cm) has proved a challenge. Recently, we took Odin and his sire Marcus Aurelius (Aurelian x Fiesta Magica) to Moores Farm for an Eventer Challenge – a course of show jumps followed immediately by simulated cross country fences – which both boys thoroughly enjoyed. Marcus, always the fool, tapped out possibly the easiest fence in the 90cm course (not big enough for you, Marcy?) and Odin sped round the 100cm for a fast double clear. Too fast, in fact, for the optimum time and we were knocked off top spot and into third because of our naughty time faults, but I was delighted that Odin was feeling so confident. While Marcus may wish to take a back seat through winter, Odin will certainly be one to watch out for as we guide each other back up the heights! Avonbrook Stud had a very special arrival in October 2018. Blue Delphinium (Shadow Blue x Bey Drachma), otherwise known as Delphi, is a stunning Crabbet yearling filly who mum recently purchased from Libby Whittole in Inverness. Her bloodlines are simply divine; her sire, Shadow Blue (Banner of Blue x Kesharma), was HOYS Champion in 2004, and her dam is a full sister to Bey Dayaan (Ganamede x Gold Dayahla). 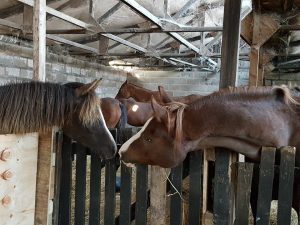 Although we don’t often have reason to buy horses, we breed our future riding horses, we did notice a distinct lack of purebred mares not related to Marcus from which to produce our future riding horses. Interestingly, Delphi’s breeder is the sister of Diana Whittome – Marcus’ breeder – and Delphi is currently around 18 months old, the same age Marcus was when mum bought him! We initially intended for Delphi to live with the foals – Maddie, Avonbrook Winter Queen (Marcus Aurelius x Avonbrook Summer Breeze), and Archie, Avonbrook Beltane Silver (Marcus Aurelius x Caveland Calypso) – but mum noticed how nicely Penny, Annia Aurelia (Marcus Aurelius x Bint Zaehaebi), was talking to her and, well, the rest is history. Currently, Delphi occupies a large loosebox with the foals during the morning and then turns out with Penny in the afternoon. 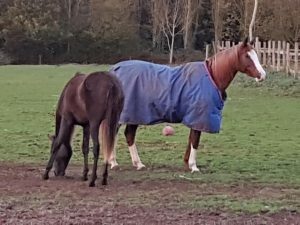 Somewhat worryingly, Penny has taken Delphi on as a protege which probably means another Princess on the yard, but I’m so relieved that Penny has finally found a horse worthy of her time and she actually looks after her almost like a mother. I didn’t know she had that in her! Penny, who has finished her showing season for 2018, has also been pulling her weight in the jumping division when not nannying the new girl. 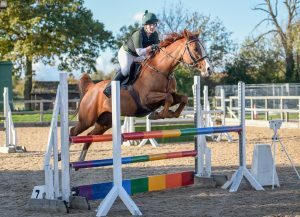 After showing her capability over coloured poles, we took her to a local competition centre to compete in the 80cm, where she dutifully jumped a careful double clear and took third place in a well-supported class! As tempting as it is to throw her straight into bigger classes, I’m determined to take her to a range of venues and consolidate her learning in 80cm and 90cm classes before allowing her to move up the heights. We have also had a swap around with Penny’s bits as she was becoming too strong in her simple loose ring snaffle, but she wasn’t wanting to jump forwards into her pelham bit. With Erica’s help, we’ve found a lovely little myler-type bit that gives me the brakes I need in a big ring or a cross-country course, while being easier for her to accept and work into. Although we still have the odd conversation as she catapults herself over the occasional fence, it has become a much less one-sided debate. In truth, Penny has certainly become a lot softer and more serene in recent weeks and I feel that has something to do with the increased jumping as well as having the responsibility of inducting the new kid. I’m beyond proud of how responsible and focused the demon-brat-princess is becoming! Of course, as a student now in her second year, October brings with it the first set of deadlines for the academic year. Only a few weeks into the semester, my calendar has already been inundated with report due dates, tutorial meetings, and the dreaded exam dates that hang over us all. Undeterred by the increased workload, I still venture back home every weekend to spend time with the horses, and mum, before going back to Uni to repeat the process. 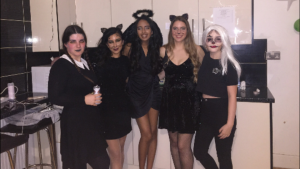 Luckily, my friends have not been completely put off by this so I am able to assure mum that I do actually have a social life beyond the horses and, joyfully, I’m never badgered into going on ‘nights out’ so my evenings can be spent curled in front of the TV watching Take Me Out and other such rubbish while we eat dinner. However, with deadlines now at the forefront of our minds, most of my time with my human companions is spent studying in the library or walking to and from lectures.